Often relegated to men wearing Wrangler jeans, driving pick-ups trucks, and pounding cans of Budweiser, the cowboy boot has a distinctly negative connotation. Unlike it’s cousin the engineer boot—a staple in Margiela collections for decades—ranch hand’s footwear of choice has remained firmly out of the fashion sphere for generations. Recently, however, a sudden fascination with cowboy culture and the American West has pushed the once overlooked shoe into the minds, and runways, of fashion’s foremost voices. With an onslaught of fall trend reports posing cowboy boots as this season’s it item, we found it prudent to explore the storied past of a shoe whose history is intrinsically tied with that of the United States. Dating back to the late 19th Century, cowboy boots first rose to prominence following the American Civil War. Originating from either Kansas or Texas—natives will fight to death claiming ownership—the shoes were quickly adopted by cattle-ranchers, who would drive their stock between the two states. Initially, these ranchers wore Wellingtons, standard issue for soldiers and cavalry during the Civil War. Named after Arthur Wellesley, the First Duke of Wellington—famous for defeating Napoleon at the battle of Waterloo in 1815—Wellingtons were adapted from the Hessian boot, a common choice for British Cavalry in the early 1800s. Story has it Wellesley asked his cobbler to remove the trim from the top of his Hessian boots, cut a more narrow shaft, and round the toe for comfort. The resulting boot, named in his honor, increased in popularity throughout Europe, and was eventually brought to the United States through the massive waves of immigration throughout the 1900s. By the end of the century, Wellingtons were standard issue for U.S. armed forces. Following the Civil War, several ex-soldiers dropped their guns for horses and cattle herds, and brought their Wellies along with them. While the Wellington’s relatively high-shaft and semi-stiff leather were sufficient for the long haul between Kansas and Texas, the rounded two made them difficult to fit in riding stirrups. So, cowboys moved back towards a pointed square toe, akin to the original Hessian boot. Additionally, rather than the soft calfskin used for Wellingtons, they opted for a more durable cowhide, better suited for hours of long riding. 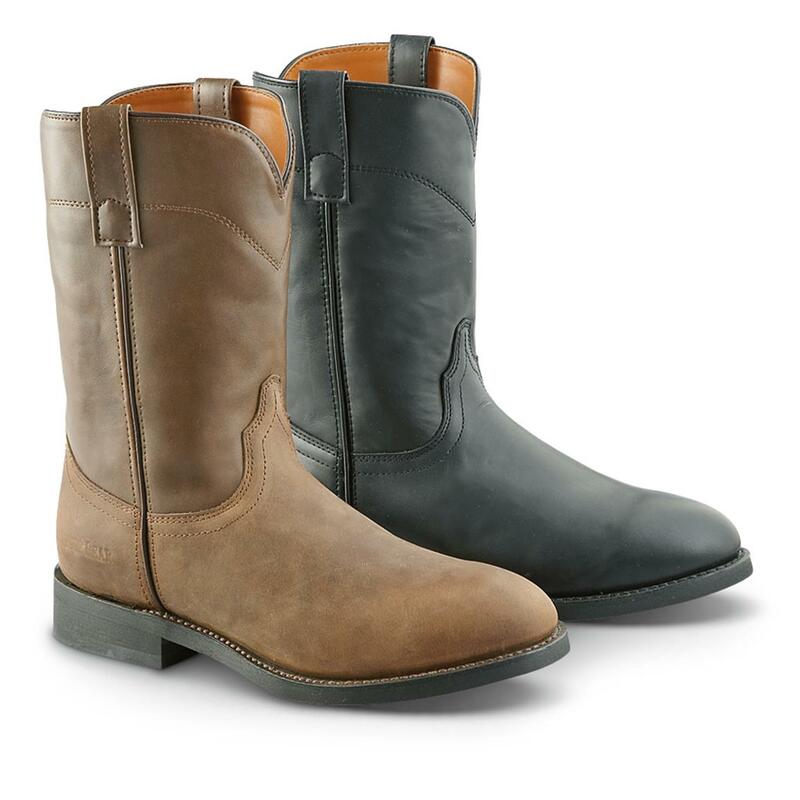 Stitched on the outside for additional comfort, with mule-ear pull-tabs and a loose shaft allowing for quick removal, the modern cowboy boot was born. While the shape of the boot is European in origin, the stacked, angled sole is entirely a byproduct of Mexico. Heavily influenced by Vaquero culture, cowboys adapted the Cuban heel into their soles, allowing them to sink their shoes firmly into the stirrups or dig into the ground when wrestling a wild calf. Originating in the Iberian peninsula straddling Spain and Portugal, Vaqeuro culture is a style of horse-riding in the doma vaquera tradition, or Spanish work riding. Brought by the Spanish to Mesoamerica in the late 17th Century, the style of cattle-herding—including horse-whispering—took root in Spanish Mexico, and eventually became fundamental to the American cowboy as they explored the West. Outside of Mexico, remnants of the style still exist, referred to as the Texas and California style of riding. While the Wellington boot was pivotal in the evolution of the cowboy boot, the heel structure, bold color choices, and experiments with ornamentation are all in the Vaquero tradition. Primarily utilitarian in nature, cowboy boots were at first limited in terms of material and design. As both a cost and time-saving measure, boots were predominantly made of brown or tan cow leather, lacking many of their modern characteristics. The less complex designs proliferated due to taste—the shoes were thought of as work tools, not fashion items—and production speed, as simple, uniform silhouettes were easy to produce en masse. Perhaps the best example of this process is Salvatore Lucchese. The son of an Italian immigrant and shoemaker, Lucchese emigrated in 1882 from Palermo, Italy by ship. Supposedly landing in Galveston, Texas, Lucchese and his brothers moved to San Antonio, where they founded their namesake boot manufacturer. Notorious engineering junkies, Salvatore and his offspring began experimenting with new inventions, constantly trying to expedite production speed. In 1890, Salvatore and his brothers purchased the first “inseamer” machine shipped to the southwestern United States, and by 1897, were already producing made-to-measure footwear. In the 120 years since, Lucchese has become synonymous with cowboy boots and the Southwest. While meager wages, World War I and a depression kept outlandish footwear to a minimum, as ranchers started making serious cash in the early ‘30s, they began to experiment with more exotic skins and finishes. To be sure, Lucchese has records of clients requesting boots in Kangaroo and Buffalo as early as 1897, but the vast majority of cowboys wore cheap, durable cowhide. Suddenly with a cash surplus, cowboys experimented with bold colors and exotic skins including alligator, rattlesnake and python. By no coincidence, this sudden interest in lavish materials coincided with the golden age of Hollywood. The increasing popularity of western films, on-screen cowboys and their real-life counterparts had a wide-spread influence over southwestern style. Film icons including Roy Rogers, Gene Autry and John Wayne helped transform the cowboy from a cattle herder into a perennially cool all-American badass. Once cowboy boots began making appearances in films, bootmakers decided to add hand-tooled designs, embossing and inlays using different leather colors that would readily stand out on screen. Suddenly intricate floral designs, stitch patterns on the shaft and the vamp and toe bags were commonplace. These trends continued well into the ‘50s, with men happily embracing garish detail and ornamentation. By the ‘60s, however, the youth began to reject the bold designs the previous generation had cherished, and once again began to reshape the boot. Suddenly colors reverted to brown and tan. As stirrups changed and technology advanced, there was no longer a need for the tall, angled heel and pointed toe. The new generation embraced a rounded toe, and lower half-inch heel, setting the stage for the modern iteration of the boot. While the general shape of the boot has essentially remained the same over the past 50 years, material choice, heel height and toe vary according to current trends. More so, as riding culture in the US has developed and specialized, boots have followed suit. In rodeo culture, for instance, the original cowboy boot proved ineffective, proving too cumbersome, hindering riders who needed the ability able to quickly hop off their horse and dash to tie up a calf. Thus, the shaft was shortened, heel made flat, and toe rounded allowing contestants to run. The resulting shoe, the roper boot, is now one of the most popular variations of the original Wellington. Although the roper has consistently been viewed as stylish, traditional cowboy boots have waned in and out of popularity for the past fifty years. Suddenly, however, they are once again in the fashion limelight. While Raf Simon’s inaugural Calvin Klein collection clearly put the shoes front and center, for the last few years they have been popping up several disparate runways. The turning point is no doubt Hedi Slimane’s debut Fall/Winter 2013 Saint Laurent menswear collection. Slimane’s first menswear shoe following his return to the label, the collection was chock full of Western references, from silver-tipped belts to bold buffalo check plaid. Most importantly however, it was the season the introduced the Wyatt boot. Referencing the classic Frye model of the same name (which has been in production for generations) Slimane shortened the shaft and pointed the toe to exaggerated proportions, to transform the traditional harness boot into a rockstar staple. The shoe was a smash hit—particularly the nut suede variation—and was eventually included in the permanent collection, available season after season. While Slimane’s shoes certainly had a rockstar bent to them, the Western influence was more than apparent. In the wake of Saint Laurent’s massive success, suddenly kids were tossing their sneakers away for a pair of hard-bottom ankle boots. The trend continued when he introduced the Santiag, a cuban heel style inspired by traditional Vaquera boots—a reflection of both his environment (Los Angeles) and another nod to cowboy culture. Other brands were quick to take notice. More a commentary on thrift and club culture than a sheer ode to western style, Demna Gvaslia included exaggerated renditions of cowboy boots in Balenciaga’s Spring/Summer 2017 menswear collection—his first for the house. Featuring thigh-high mens western boots in white, red and even embossed python, Gvasalia helped perpetuate the idea of cowboy boots as a legitimate player in the male wardrobe. Indeed, the retail versions, with considerably shorter shaft and heel, were a major success, enjoying both celebrity endorsement and huge sales figures. Hood By Air (RIP) also tackled the cowboy boot in its own ersatz way during the Spring/Summer 2017 season, making a two-sided cowboy boot in various offbeat colors in a collaboration with Frye. Simons’ Calvin Klein 205W39NYC boots, then, are the runway’s attempt to bring the style full circle. Presented as in his debut collection, they are part of the tapestry that together depicts an immigrant's view—his view—of America. With fake fur coats covered in plastic reminiscent of linoleum couch covers, and blankets sewn into the interior of parkas, Simons’ depicted America in earnest, making even our more tacky elements beautiful. His inclusion of the cowboy boot is significant, implying that, in Simons’ worldview, it is the definitive American shoe. With the fashion world in full support, the cowboy boot is suddenly covetable, and sure enough, traditional boot companies are attempting to cash in. Lucchese is perhaps the best example. Between a collaboration with Vementens to a brand campaign led by fashion’s favorite offbeat street style photog Mr. Mort and a co-sign by Luka Sabbat, Lucchese is quite clearly attempting to cash in on their sudden relevancy. Frye too is attempting to do the same, hiring Emily Ratajkowski, Kit Harrington, and the aforementioned Sabbat as brand ambassadors. Clearly, with presence on both the runway, unparalleled heritage and gracing the feet of stylish guys everywhere, cowboy boots are officially cool. The question, however, is for how long. While trends tend to die hard and burn out fast in our current fashion environment, if you ask us, a pair of black alligator boots, just like the Marlboro man and John Wayne, will be cool forever.